Since starting up and heading out on our first tours we have had the honor of meeting great bloggers, tv personalities, famous foodies and avid adventurers. We shared our food tours with them and learned a lot along the way. Check out the great TV shows, blogs, videos and mentions they have shared about us! 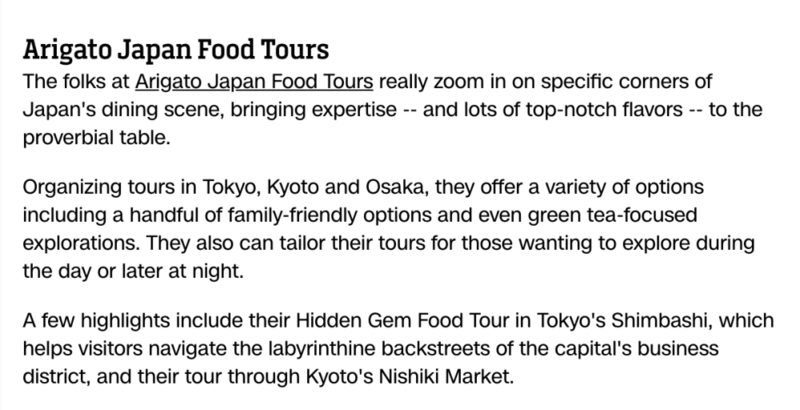 We’re really proud for being listed on CNN Travel as one of the best tours happening in Japan! 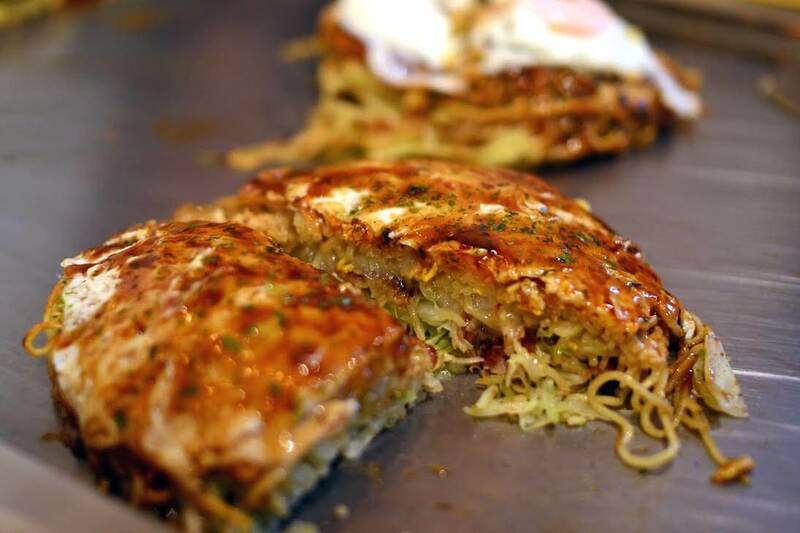 “Arigato presents a blend of authentic and popular cuisines with historic and cultural context. 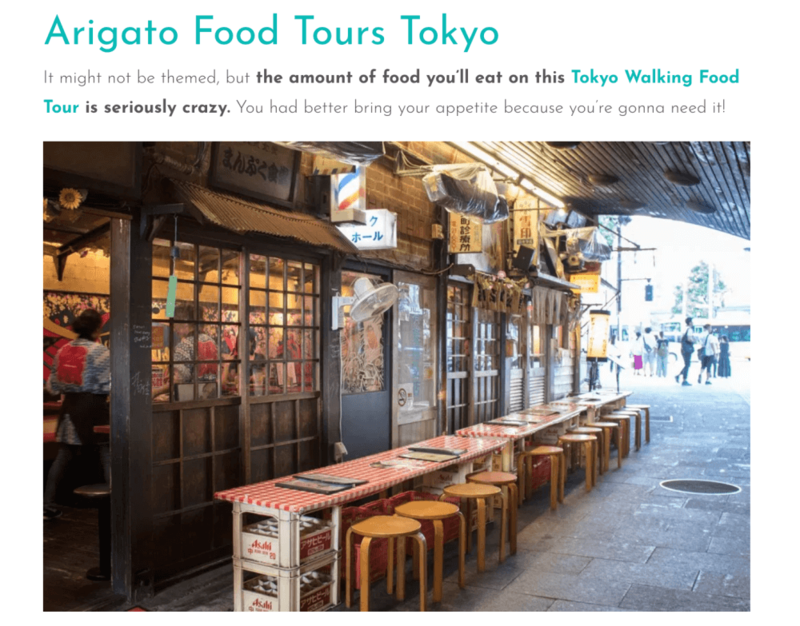 You’re not simply gorging on good food, you’re learning why Tokyo eats what it eats. And if you come hungry, you’ll leave happy.” – Thanks Mo Mozuch from Newsweek! 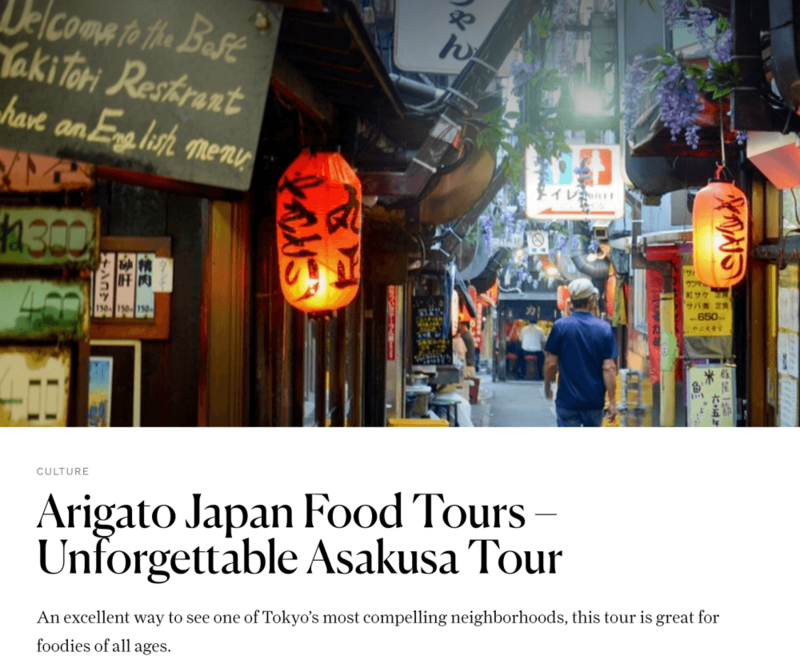 According to Condé Nast Traveler, our Asakusa food tour is “An excellent way to see one of Tokyo’s most compelling neighborhoods, this tour is great for foodies of all ages.” — Thank you! The great and genki EricSurf joined our Retro Shibuya Tour and he had a lot of fun according to his video! 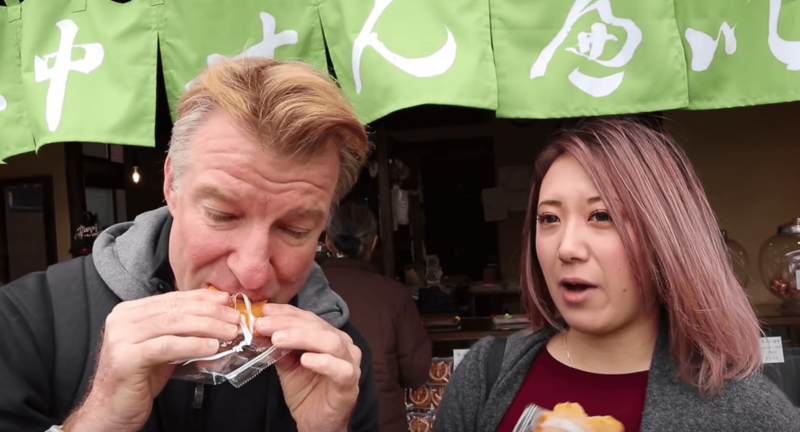 The great David’s Been Here joined our Crazy and Kawaii food tour in Harajuku and he loved it! 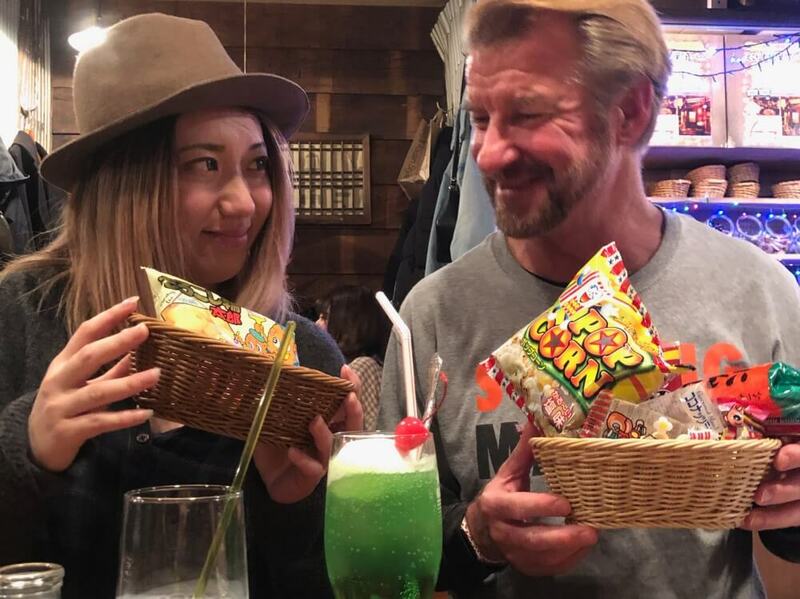 The great EricSurf6 joined our beloved guide Asami on our Yanaka tour and he loved the experience! 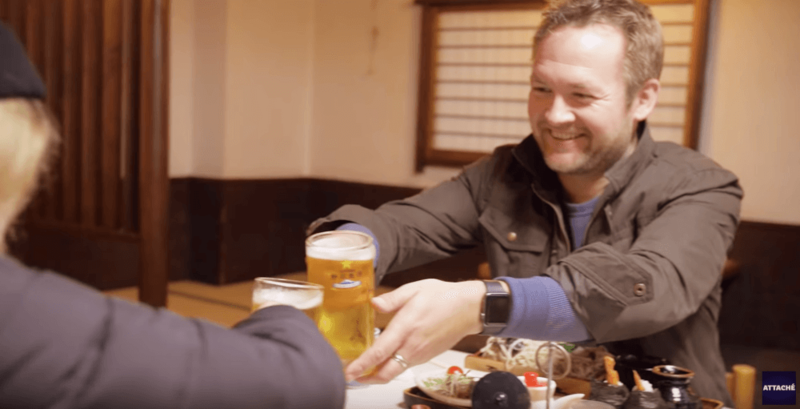 Alex Hunter from Attaché joined our Mount Fuji famous food tour and create a mini-episode about it! 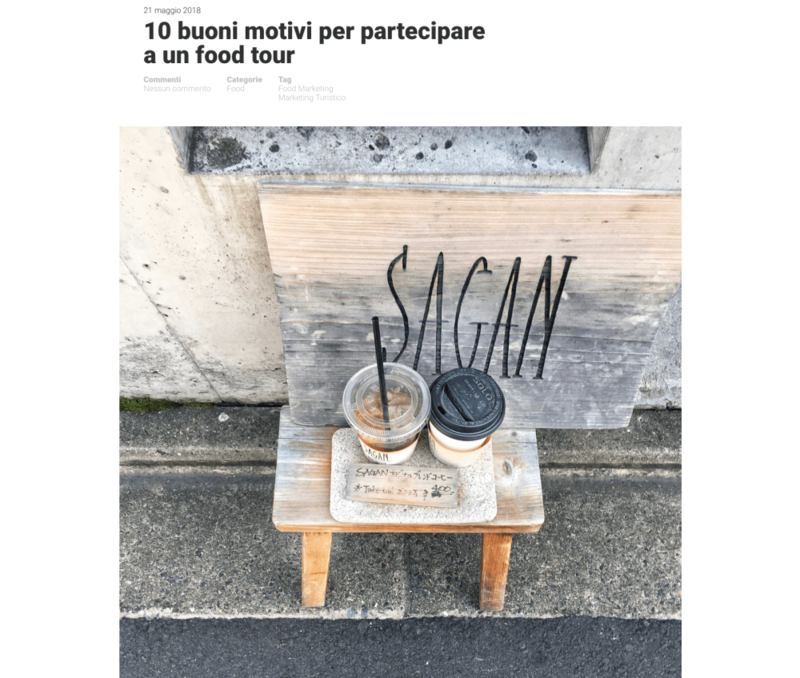 “We’ve done a lot of food tours around the world, and this is our favorite. 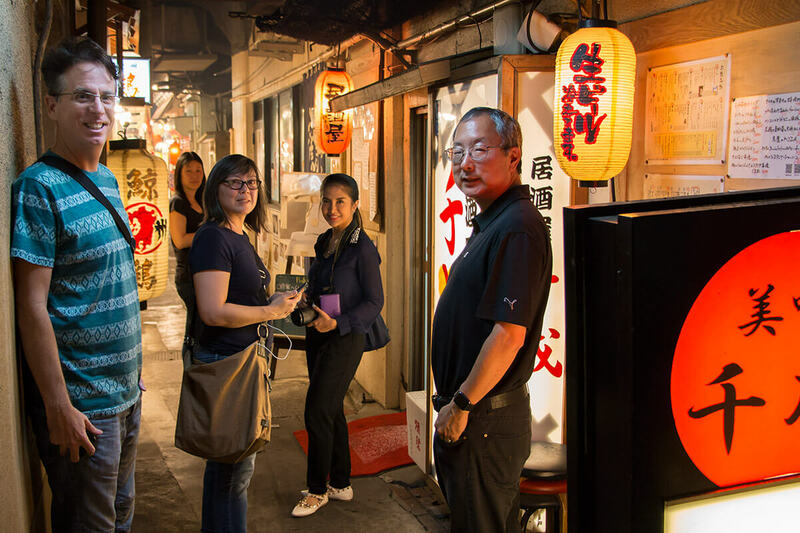 My daughter instantly bonded with our guide Asami, and we had a great three hours exploring the Asakusa area – even in the rain.” Thanks a lot for the kind words Travel Babbo, it was a pleasure having you and we hope to see you again soon! 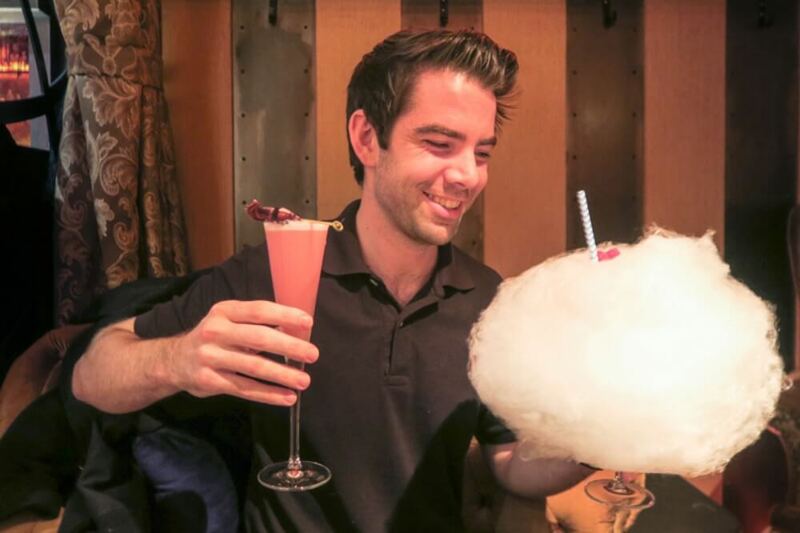 “Arigato Food Tours Japan definitely enlightened me on where to spend my evenings in Tokyo. The Luxury Tokyo Sake, Cocktail, Whisky and Pairing Tour turned out to be very enjoyable and educational. I learned a lot more than I expected about a wide range of Japanese related topics. 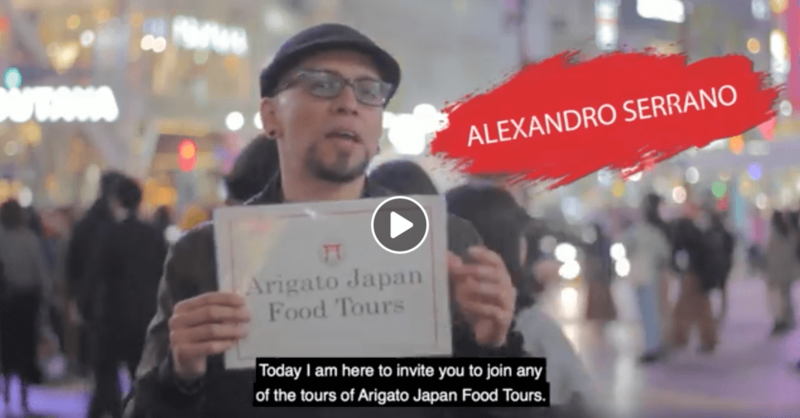 If you’re looking for a great way to dive head first into the nightlife of Tokyo book a tour with Arigato Food Tours Japan!” Thanks a lot Pierre Blake, glad you liked it! 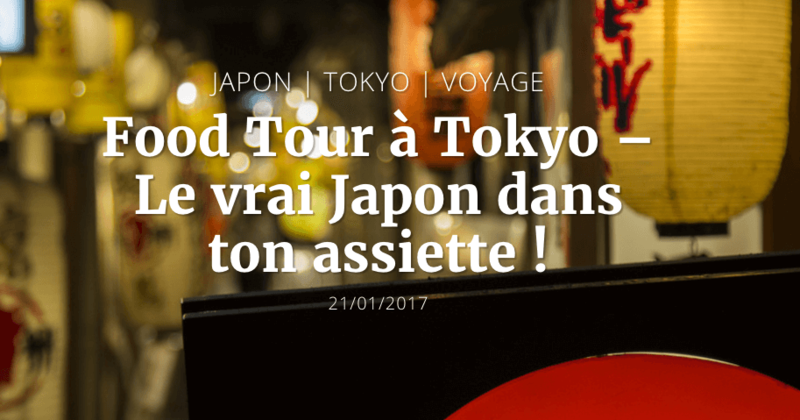 Learn more about our Tsukiji tour in German (English substitles available) thanks to Bontenmaru! We have been glad to host CSQ on our Gion food tour in Kyoto. Thank you for coming! 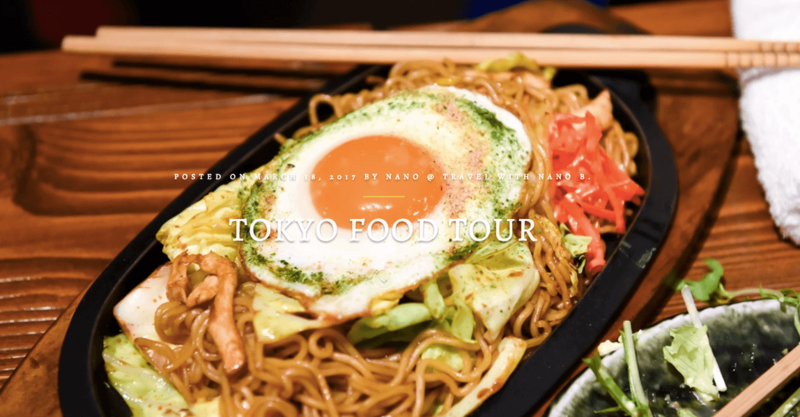 Here is “the best way to discover the food in Osaka” according to the show Attaché from UK. Thank you so much for joining us! 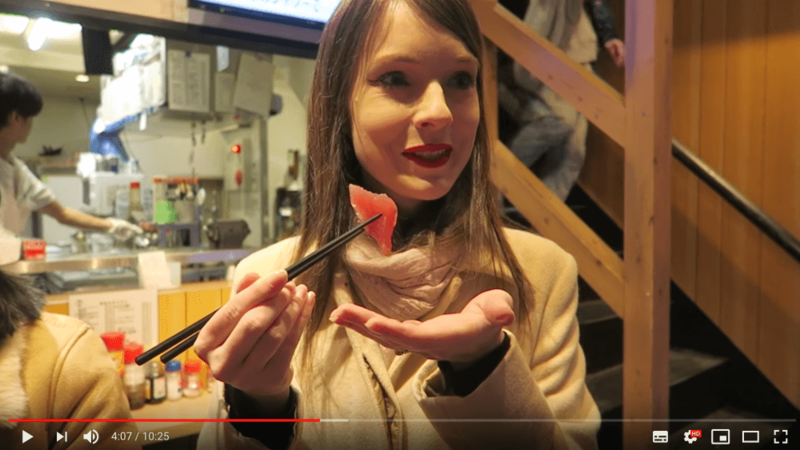 We had the wonderful @Morgain_Le_Fae on our Retro Shibuya food tour a few weeks ago and here is her video! Here is a promotional video by the Mexican film maker: Carlos Delfín. Discover one of our tours in Spanish (with English sub), thanks to our beloved guide Alex! 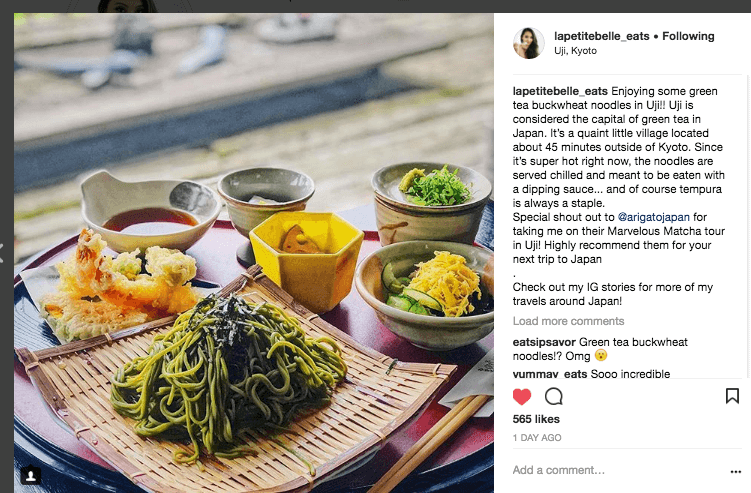 We had the great Expatolife on our Hidden Gem Food Tour in Shimbashi and it seems she had a very good time according to her post! 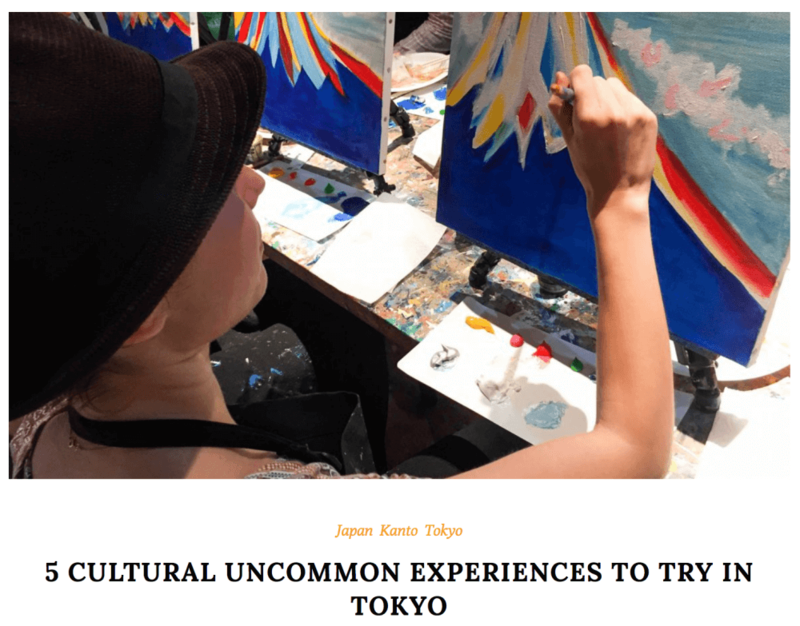 The Italian blogger Warmcheaptrips joined us on several tours and listed us in her uncommon experiences to try in Tokyo! It has been a pleasure to have the great Emily Luxton on a tour! We’re glad that she loved it and she recommends the experience on her website. 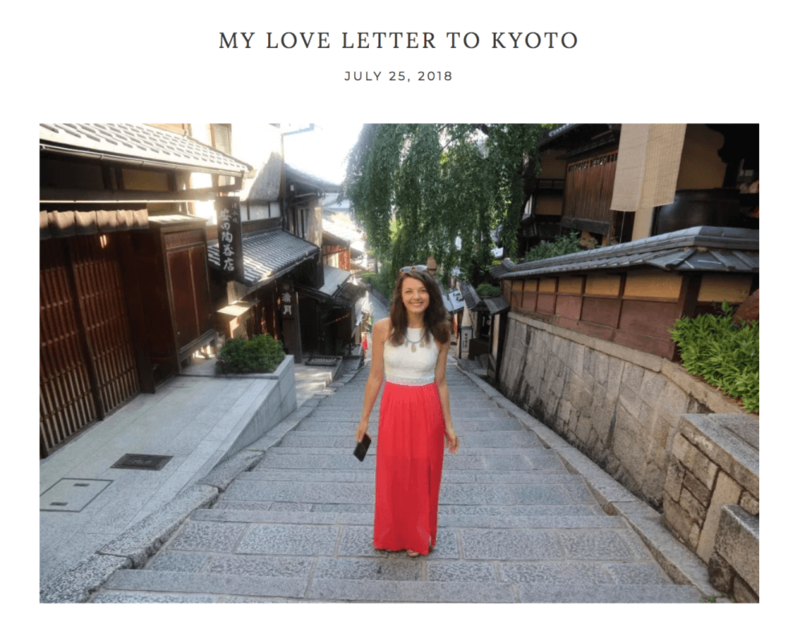 The foodie and blogger Maricler joined us on a tour in Kyoto and here are 10 good reasons to join a food tour according to her! 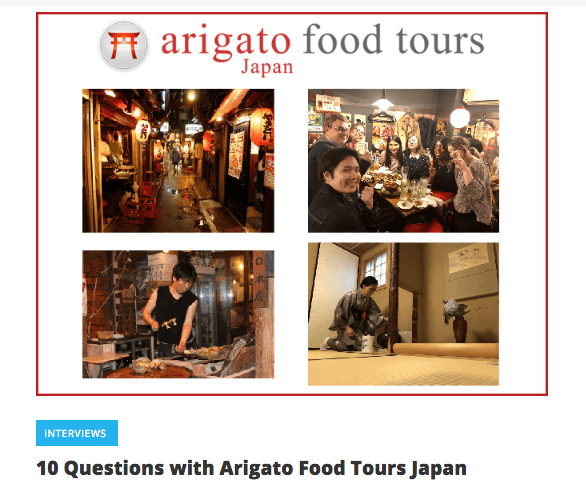 We were recently interviewed by the fabulous Japanese food site Pogogi. This 10 question guide is a great way to get to know us and what we do. They have a terrific food site to explore! We loved spending time with Will from GOING AWESOME PLACES! 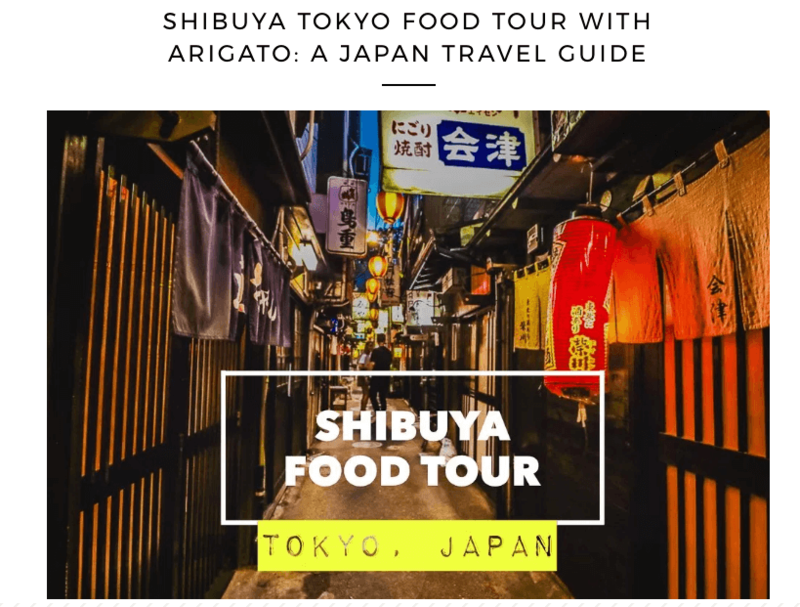 and we are proud to be on his Ultimate Food and Travel Guide to Tokyo. And in an amazing YOUTUBE video from our All Star Tour! 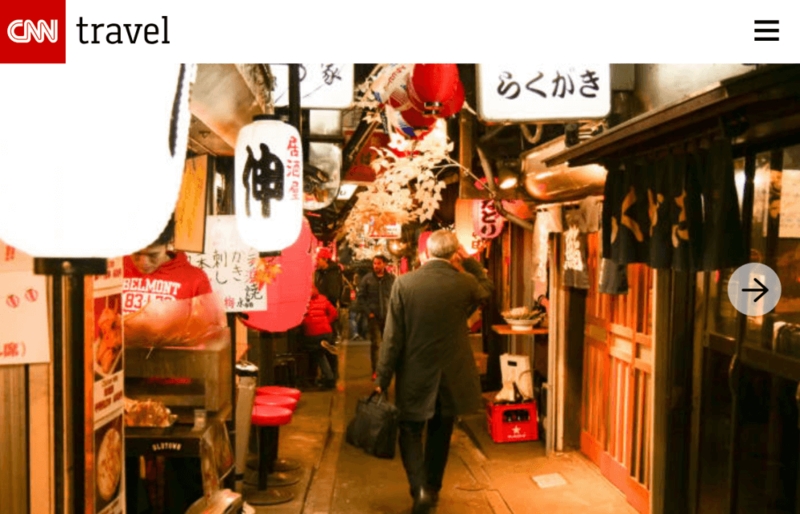 We truly enjoyed exploring the Nishiki market in Kyoto with French Travel Blogger, Brice of WorldWideBrice. This historic market shows a window in to traditional cuisine in Japan’s ancient capital. 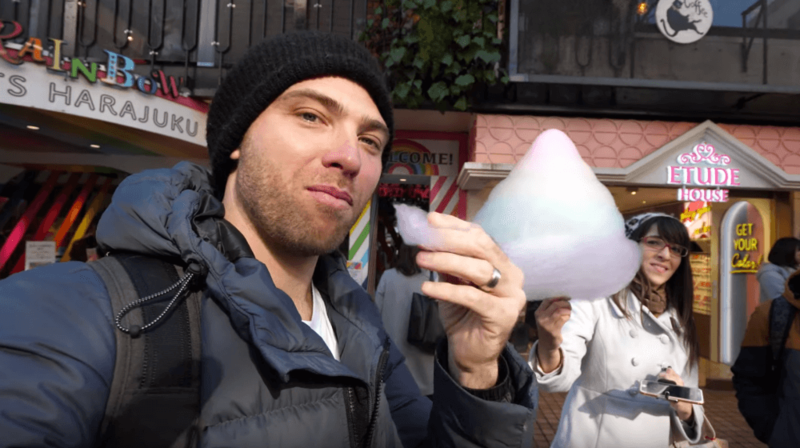 Jon Barr, former sportscaster turned YouTuber and Instagrammer covered the launch of our newest food tour in Osaka! 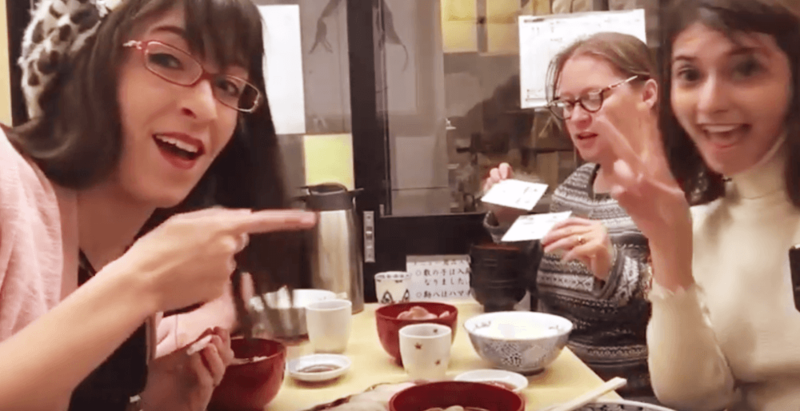 The retro food tour in Shinsekai. 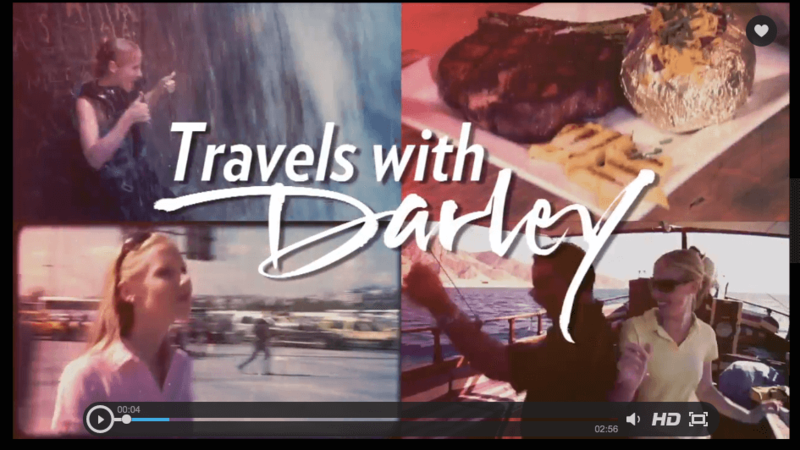 Check out his super fun video trying local food and learning about the colorful history of this downtown entertainment district. Amazing Instagrammer and blogger Nano B. joined us for our Mt. 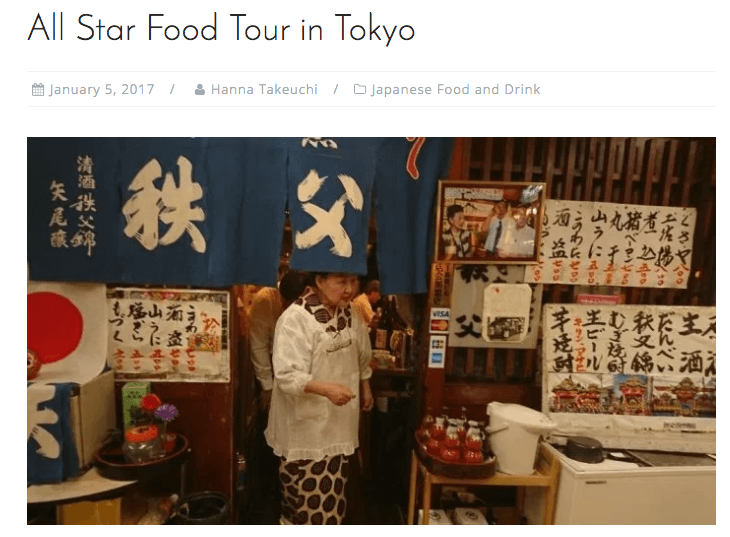 Fuji Food Tour– great eats, beautiful views and lots of small town, off the beaten track, hospitality. 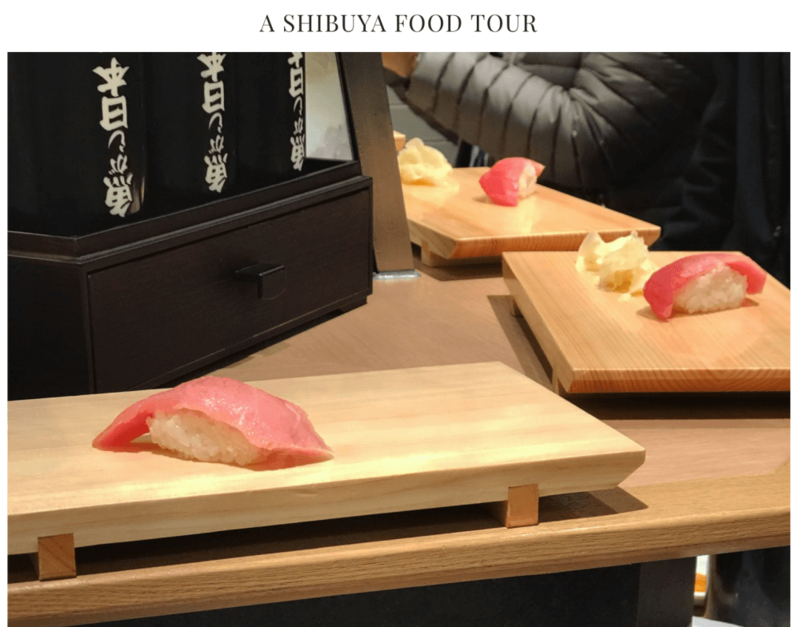 Her post is a wonderful round up of experiences and yummy memories to be made on this special food tour! Traveling family, Kelly, Aaron and Hudson from “No Man Before” took a street food tour with us recently and we loved sharing the best tastes of Japan with them! We love meeting and sharing Japanese food with social media creators from all over the world! 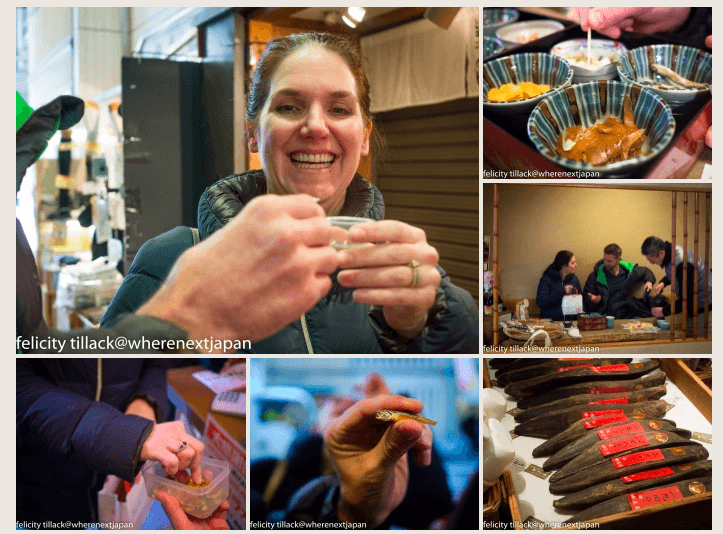 Check out Travelista Terri and her explorations on our Arigato Japan Food Tours! Recently we were featured in this great article on ETB Travel! 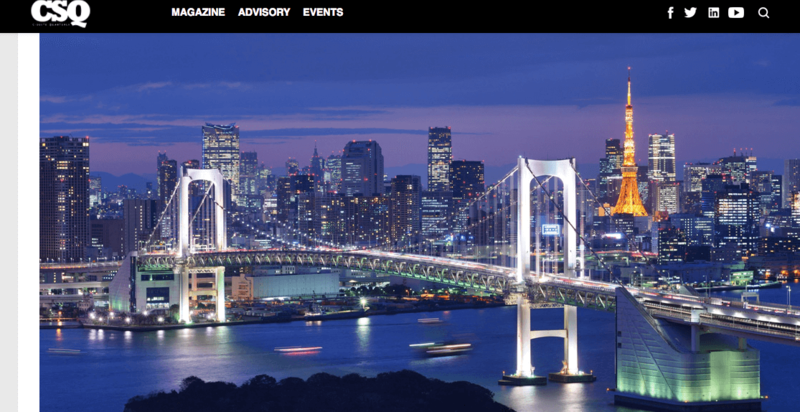 Tokyo is the hot place to be this year– we agree! 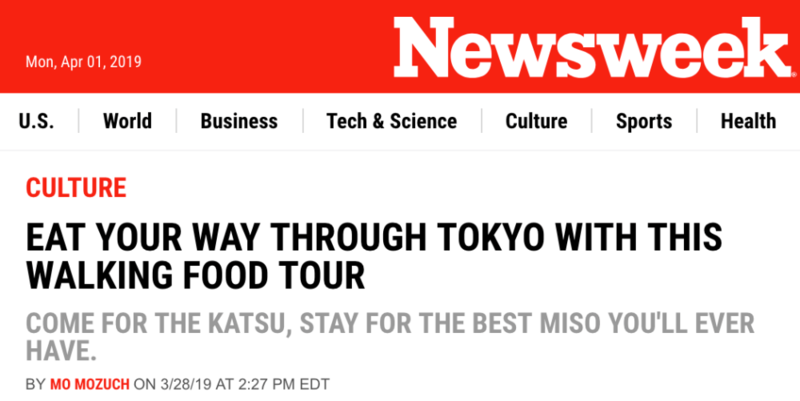 Travel Weekly, one of the industry’s top publications, featured Arigato Food Tours in their recent highlights of things to do when traveling to Japan and Tokyo! In this piece were are listed right alongside of some amazing and famous brands and hospitality providers. 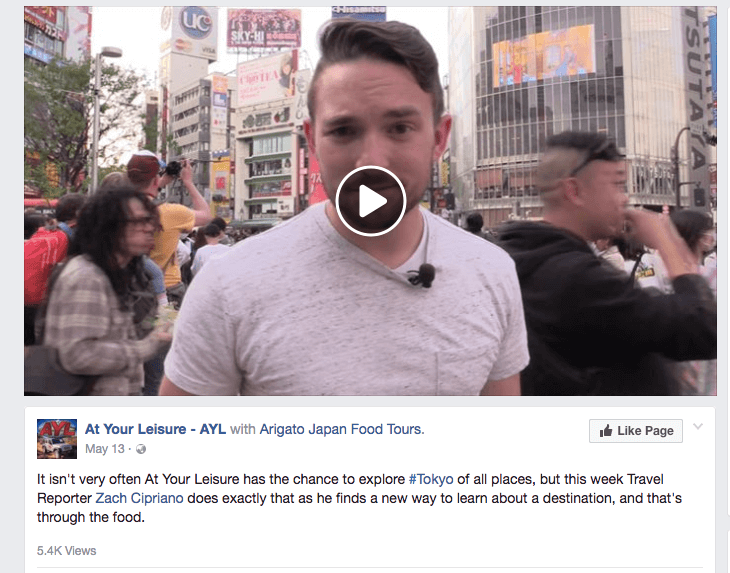 We are so proud that Arigato Japan was featured at the New York Times Travel show — for great experiences in Japan. The One Hit Wander– came with us to our Mt. 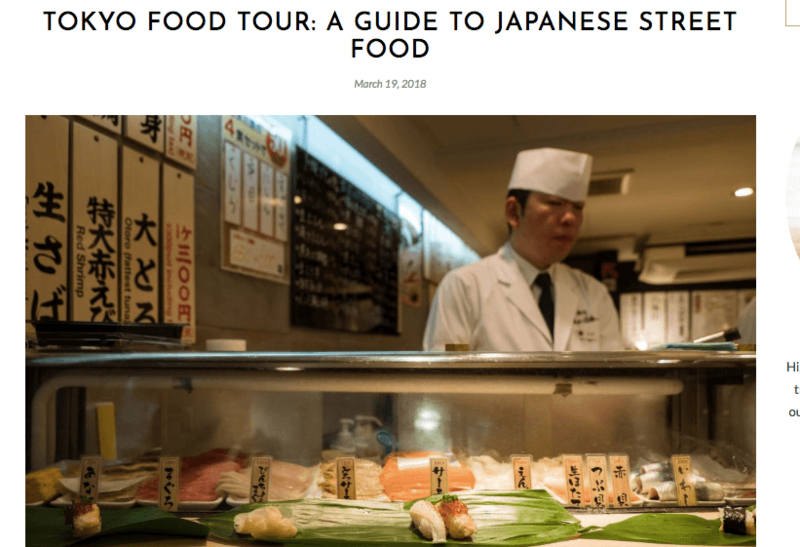 Fuji Food Tour, check out his terrific post and get a view of our newest tour, here. 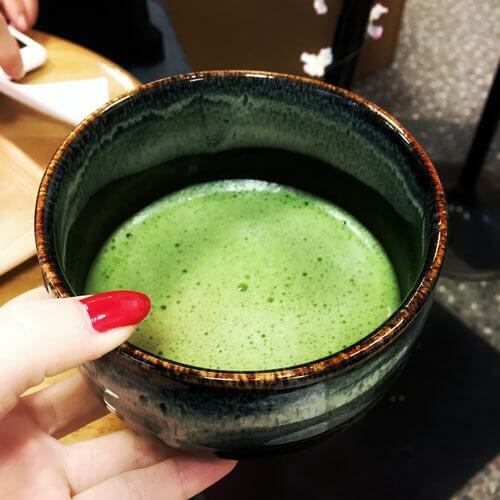 Check out this segment from Travels with Darley as she explores Tokyo for Foodies with our guide in Shibuya! 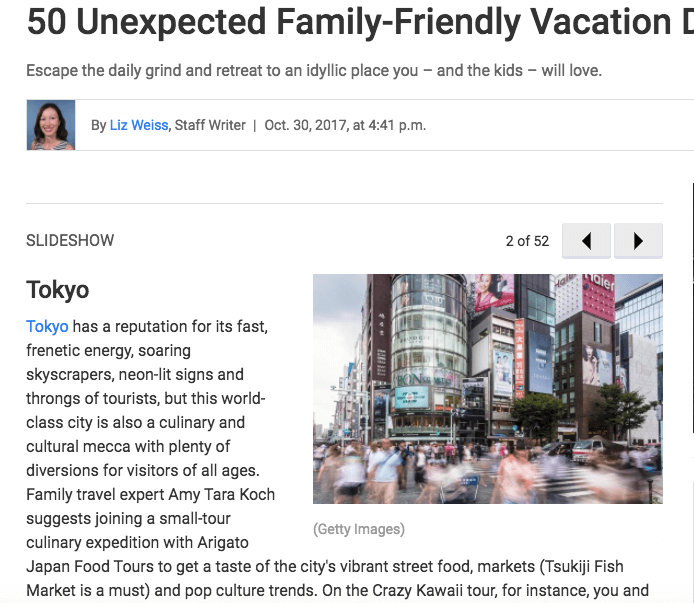 Arigato Japan was featured in USNEWS feature of 50 Fab Family Vacation Destinations in the Tokyo Section! Exciting! Read about our newest Tokyo tour in Harajuku- for high fashion, great design and the cutest pop-culture food in the city. 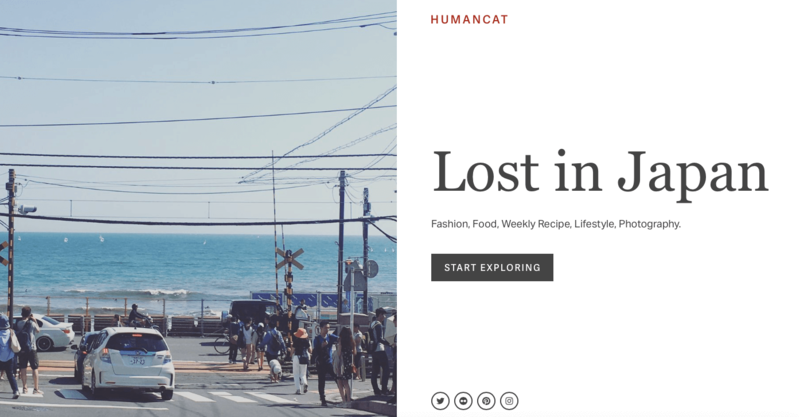 Love this write up from the HUMAN CAT blog Travel and Fashion Blog. Sometimes it can be hard to choose the best activities that families can enjoy all together. Need something fun for Mom & Dad and All the kiddos? My Little Nomads chose our Shibuya Street Food Tour and had a great time! Read their Tokyo list here (we are right at the top!) 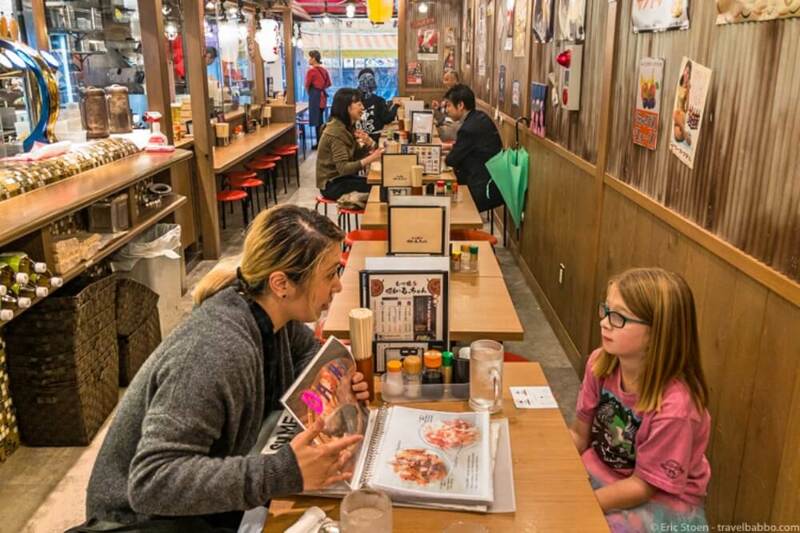 — By the way our Asakusa and Harajuku tours are also very family-friendly! We were lucky to hang out with the Nomadic Boys— Stefan and Sebastien who have been travelling the world together since 2014 after leaving their lives in London. Their blog is a great platform of their romantic adventures, their views ons the different gay scenes and of course, their culinary discoveries. They had nice things to say about us! STREETFOODI – The experts over on Streetfoodi enjoyed exploring some of Tokyo’s cheap and cheerful delights with us on our Shibuya tour! Read all about it here. 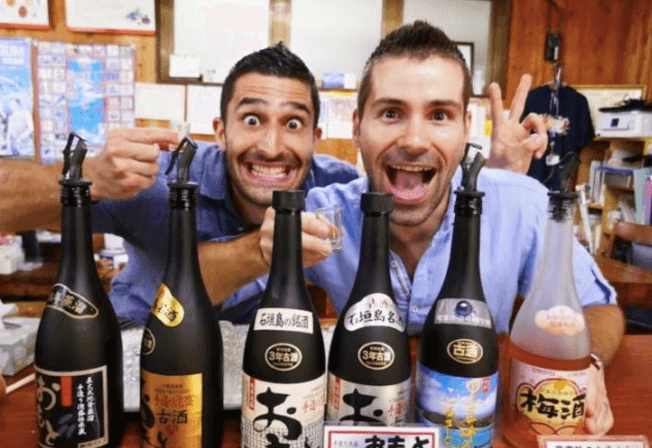 Agustin Neglia Television producer who chronicles his travels around much of the world met up with Arigato Japan Food Tours for an experience to remember. 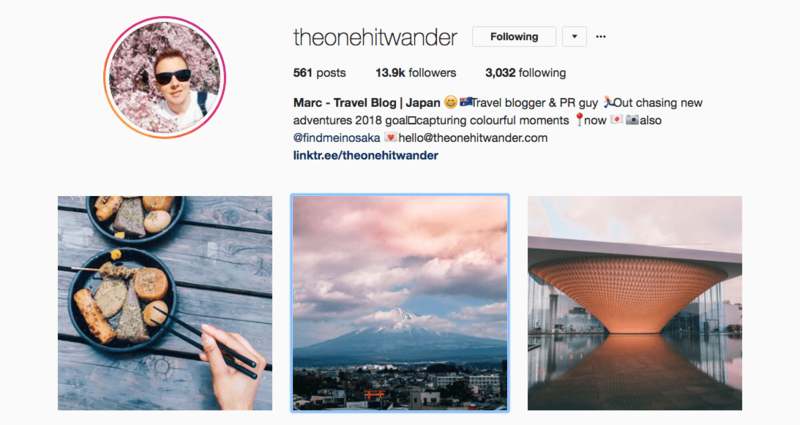 Aileen quit her corporate job in the Philippines at age 21 to follow her dreams of traveling the world — but after a few months… she made a huge impression! She is now a successful digital nomad (online entrepreneur & travel writer + vlogger) living a sustainable travel lifestyle. Check out what she has to say about our tours! At Your Leisure. Video report with Arigato Japan! Feature Post on Travel with Nano B. — Nano is a 32-year-old serial expat currently living a dream in Tokyo. She is a freelance writer, photographer and travel consultant. The folks at Contemporary Nomad joined us for our All Star tour, read about their experience here. We had a blast exploring the food scene in Shibuya with Adelina — a part time traveler, exploring the world despite having a full-time job. Pack Me To is her collection of stories from her travels and adventures around the world. Read about her evening with us here. 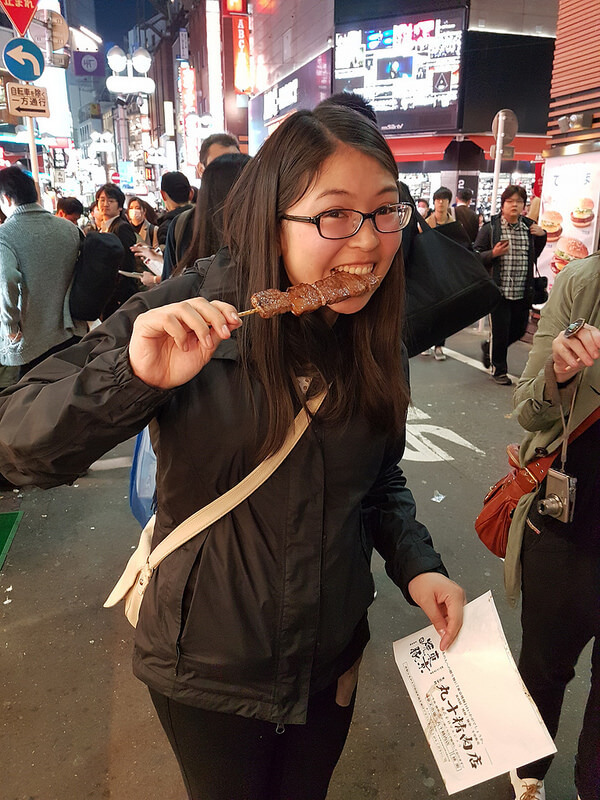 Enjoying Kobe Beef Skewers- Shibuya Street Food! 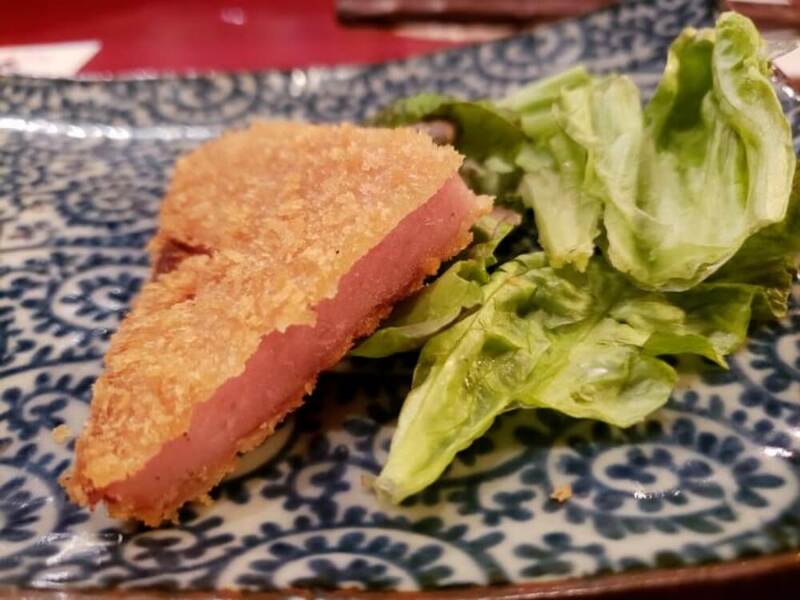 We love exploring the food scene in Tokyo, Osaka AND Kyoto– check out our Nishiki Food Tour in Kyoto as experienced by Felicity from Where Next Japan! 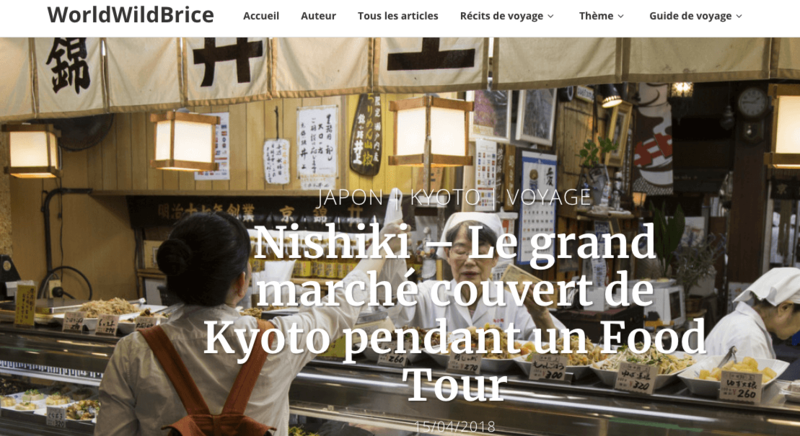 Exploring Kyoto's famous market with "Where Next Japan"
Hannah, a freelance writer at True Taste Tokyo also had a terrific time on our highly rated All Star Tour in Tokyo. Read about her delicious experience. 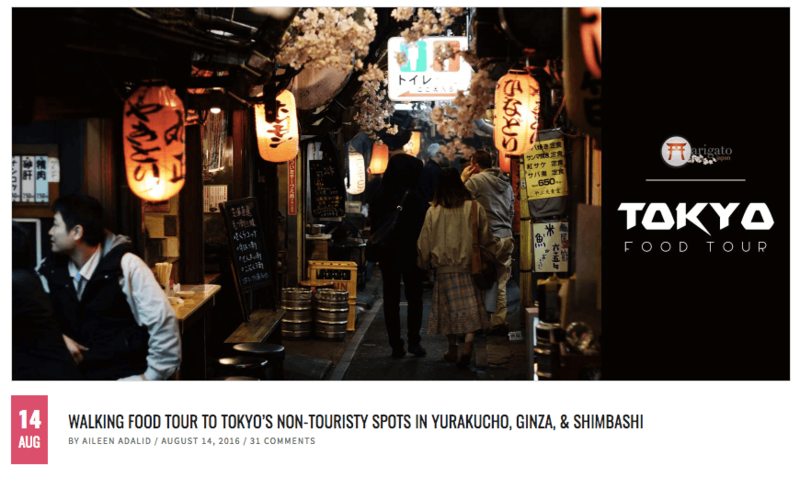 Saki Akane from the Human Cat blog enjoyed exploring with us in Yurakucho and on our wonderful daytime tour in Asakusa. Lauren and Ben from Television of Nomads were lovely and they seemed to really enjoy the bright lights, and tasty street food on our Shibuya Tour! Happy to be included in this travel recommendation roundup on CSQ. Are you a blogger, TV show fixer, Vlogger, Instagrammer with a dynamic tribe of followers? Contact us before your trip to Japan and see how we might be able to work together!